The Food Systems Working Group and CASFS offer a series of cooking classes through recreation department this fall. 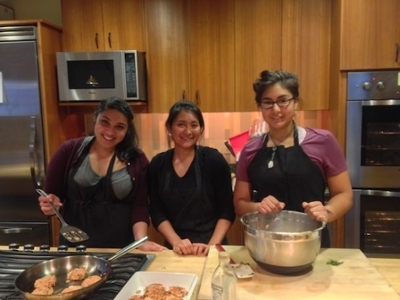 Learn basic kitchen skills at this fall's Slugs in the Kitchen workshop series. A new "Slugs in the Kitchen" series offered through UC Santa Cruz's recreation department debuts this fall with a quarter-long sequence of cooking and nutrition workshops. The workshops will take place at the former Cowell College coffee shop, which is reopening as a café offering basic needs services along with coffee, tea, and snacks for all students. Stay tuned for more details on the café's services. Register online for fall quarter Slugs in the Kitchen classes and the Halloween Dinner Feast. Registration opens on Tuesday, October 2. See a .pdf of the OPERS Quarterly Activity Catalogue.